Blog : Food Marketing Tricks - Is That "Healthy"? Food Marketing Tricks - Is That "Healthy"? With our nation on the brink of a health crisis people are becoming more health conscious. This is a good thing - people are making healthier choices! Or so they think. Food companies know their products aren't healthy, so they panic. They need to keep business...what to do? Slap a claim on the box that makes the product look healthy. Food companies are tricking people into thinking they know how to eat healthy by adding a few words to their packaging and revamping their ads. Here are a few things that companies are using to trick you into thinking that you're eating healthy, and some things you can do to avoid these tricks. It sounds good right? This food is all natural, came straight from Mother Nature. Wrong! Truth is there are no requirements set forth by the Food and Drug Administration (FDA) that define what an 'all natural' food is. Any company can use this term on their packaging to appeal to consumers. Foods with refined grains, high fructose corn syrup, hydrogenated oils, and artificial sweeteners can be labeled as all natural. Call me crazy but something tells me that hydrogenated oil doesn't grow on a tree. The best way to avoid this marketing trick is to read the ingredients and nutrition facts. If there are too many ingredients that you can't pronounce or sound processed the product is not all natural. The nutrition facts are what tell you if the food is healthy or not. Look at the serving size, calories per serving, and grams of fat, carbs, and protein. Compare the serving size to the calories in that serving; if you can have a good amount of that food with not that many calories or fat, it's probably a healthy food! Another way to avoid this is to purchase organic foods. The use of the Organic seal is regulated by the U.S. Department of Agriculture (USDA). 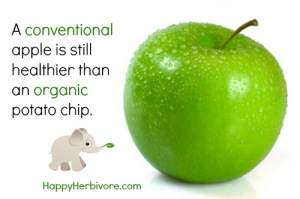 Foods that say organic on them are made with 95% or more organic ingredients (no hormones, genetically modified ingredients, additives, antibiotics, or radiation). Products can say 'made with organic ingredients' if they are made with at least 70% organic ingredients. However, I still encourage you to still read the nutrition label. Reducing sugar intake is a great way to be heath conscious. However, foods that claim to be sugar free or have no added sugars often contain artificial sweeteners or man-made sugar alcohols. Sugar alcohols also contain calories, so they can add up. Not to mention these can both cause digestive discomfort and problems (a lot of bloating doesn't suit anyone). It's better to choose real sugar or foods with real sugar in them. A good way to sweeten foods without adding any processed sugar is to use fruit, agave, honey, or maple syrup in moderate amounts. Common sugar substitutes and sugar alcohols to look out for are: Sucralose, Aspartame, Cyclamate, Saccharin, Maltitol, and Sorbitol. These terms are all commonly used on bread and bread products. But which are scams and which are actually healthy? Wheat- the term 'Wheat' on a product just means it is made with wheat flour rather than regular white flour. It doesn't offer any additional health benefits when compared to white flour. Both are processed and stripped of the nutrients. It might say enriched wheat; this means that after processing some nutrients are added back in, but not all that were originally removed. Wheat as a marketing term doesn't mean it is any healthier than white. Opt for whole grain or whole wheat (more on this in a minute). Multigrain- this marketing term refers to products with more than one type of grain. Unless all of the grains are unprocessed and whole, the term multigrain is useless. Read the ingredients to find out if the grains are whole or processed/enriched grains. The key word is WHOLE. Yes, multigrain can be good for you, just read the label to make sure you're getting the whole grains. Whole Wheat and Whole grain- These are the terms you want to look for when purchasing bread or bread products. These refer to products that use the entire wheat kernel or the whole grain kernel. They retain all of their nutritional value- fiber, protein, vitamins, and minerals. Not to mention, whole products will help keep you fuller longer and help you lose weight or maintain a healthy weight. To recap- look for the packaging with the word WHOLE on it. Who doesn't want a food with less of that awful word? But unfortunately this is just another marketing scam to get people to think they are eating healthier. More often, the fat- free version of a product and the regular version have about the same or close to the same amount of calories. The catch is fat free versions have extra sugars and other chemicals in them to make them taste better. To avoid this, purchase the regular version of the product and cut the serving size back a little. This will save you the calories you would have consumed had you bought the sugar loaded, chemical loaded, fat free version. **One exception to this is fat free dairy- dairy products that are fat free or reduced fat mean they are made with skim milk or 1-2% milk rather than whole milk or cream. This applies to yogurt, cheese, cottage cheese, and other dairy products. It is still a good idea to read the ingredients in yogurts and ice creams; they may still contain some extra added sugar, artificial sugars, or sugar alcohols. Made with real fruit implies that you're getting nutritional value from eating that strawberry flavored candy. That would be nice, but in reality made with real fruit doesn't make it a healthy choice. If one of the ingredients is "fruit juice concentrate" (which according to the Dietary Guideline for Americans is just another form of sugar) it's not a fruit, it's just sugar. If the label claims "not from concentrate" that means juice from a fruit is collected, filtered, and pasteurized. In the concentrating process and the pasteurization process, vitamins and minerals are destroyed and you're left with pure sugar and no nutritional value. Some labels even say "counts as one serving of fruit." Even if the food item counts as a serving of fruit you are consuming added calories and sugar (sometimes artificial sweeteners/sugar alcohols) so you're better off skipping these and just eating the actual fruit. It is easy to fall into this trap; that's why food companies use these. The best way to avoid all of the marketing tricks is to read the nutrition label and ingredients when you are grocery shopping. If there are a lot of ingredients you can pronounce or a very long list of ingredients, its probably not a good choice. On the nutrition label, if there are a lot of calories in a small serving, you might want to pick something different. This way you are better equipped to make healthy choices! Jenna is a graduate student at D'Youville College, completing her master's thesis in dietetics, with a focus in sports nutrition and the diets of professional athletes. Her undergraduate work was in biology and chemistry, which led her into the field of nutrition. She is a member of the Academy of Nutrition and Dietetics, as well as the Sports, Cardiovascular, and Wellness Nutrition dietetic practice group. In her spare time she enjoys running, spinning, skiing, being on the lake, going to as many concerts as possible and taking mini vacations every chance she gets. She currently live is Buffalo, but plans on applying for jobs in Denver and Nashville after graduation. But, she will always be an avid Bills fan wherever she ends up.